WebsitePanel is a control panel to automate the provisioning of a full suite of website hosting services on Windows shared hosting plans. It enables you to centralize the management of your website, create and manage users, mailboxes, host domains and much more… all within a single interface! 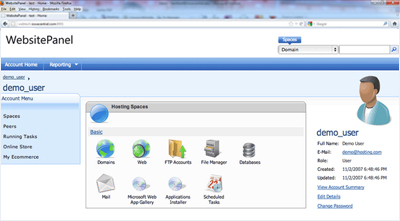 An added benefit is that you can also offer reseller hosting using WebsitePanel. Main Hosting Features. Tailored to fit your needs. We have everything what you're looking for.